Scorpions are an issue that most people living in the Gilbert, Arizona desert have dealt with. Preventing an scorpion infestation before it begins will keep your family safe from potentially life-threatening scorpions before you call a scorpion control company. The scorpion is a type of predatory arachnid, similar to spiders. Scorpions have eight legs and are easy to recognize for their large, upward curled stinger and front claws (or pedipalps) similar to a lobster’s. Scorpions are venomous and the venom from their stinger, depending on the type of scorpion, could range from irritating to downright lethal. Scorpions range in size from around nine millimeters to nearly nine inches. Only about twenty five out of the existing 1750 scorpion species are considered dangerous to human beings. More often than not, scorpion stings really hurt but are usually harmless. However, elderly people, people with allergies to scorpion venom, and children can be in danger. Scorpions tend to mate around spring and autumn and will be more frequently seen. The bark scorpion is especially common around those times of year, and their sting can be fatal for some people. Bark scorpions rang between an inch to three inches in length and dark in color. Keep an eye out for this type of scorpion around those times of year. Scorpion’s bodies contain a chemical that reacts with a black light. Take one around the outside of your house after dark and shine it against the ground and sides of your house. If you see an iridescent glowing shape, congratulations! You found a scorpion. Maybe congratulations aren’t in order, but the black light method is a good way to scope out if scorpions around crowding around the outside of your home. If they are, there could be a few inside your house as well. Reduce standing water in and around your home as much as possible, as standing water will attract thirsty scorpions. You should also make a habit of closing the toilet bowl lid and checking it before sitting down just in case. Like many pests, scorpions can get in your home through gaps in your doors or windows as well as through cracks in your plumbing or walls. Seal up those danger areas to keep scorpions from trespassing inside your home. If you leave your shoes outside or near a door, always try to shake them out before putting them on. Scorpions have a tendency to hide in shoes, especially boots. Hands and feet are the most common spots for scorpions to sting. Scorpions love to hide under firewood, brush, and rocks, so these things should be kept far away from the sides of your home. Thirty feet is usually the standards. There are many accessible and inexpensive products out on the market for scorpion control in Gilbert. Products such as barrier tape are handy for keeping scorpions out and certain home treatments are lethal to scorpions. It is important to remember that while scorpion prevention is wise, the actual extermination of scorpions should be left to the pros. If you’ve found scorpions in your home, you should not try to take care of the problem on your own. Trained extermination specialists know exactly what to do and what to use when it comes to scorpions, and trying to take care of the problem by yourself could be very dangerous. Pest control specialists will often apply a scorpion home sealing treatment to a home to get rid of any intruding scorpions for good. Who can help me with my scorpion problem in Gilbert? Varsity Termite and Pest Control is always offering deals for scorpion control as well as other types of pest control in Gilbert. 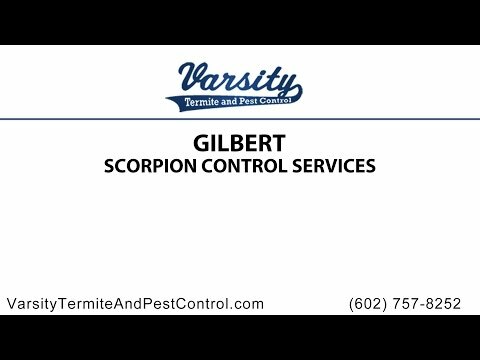 Gilbert can be a scary place when it comes to scorpions, and once an infestation starts your pets and children could be in serious danger. Varsity Termite and Pest Control is there to help with quality scorpion control. Give us a call today and we can begin the process of scorpion home sealing and get rid of those scorpions for good.